BRAND NEW 3RD EDITION: OCTOBER 19, 2016. The only officially authorized account of MANFRED MANN'S career, from his '60s hits (Do Wah Diddy Diddy, Pretty Flamingo, Mighty Quinn and many others) to successes with his Earth Band (Blinded By The Light and Runner). Many exclusive interviews with Manfred and his band members are included along with their personal histories. A complete discography and gig list are included along with twice as many archive photos as the original edition. Manfred was very kind to allow us to reprint all ten of his articles from the publication Jazz News in 1962. Now with 148 additional pages, there is even more information that you will not find elsewhere. 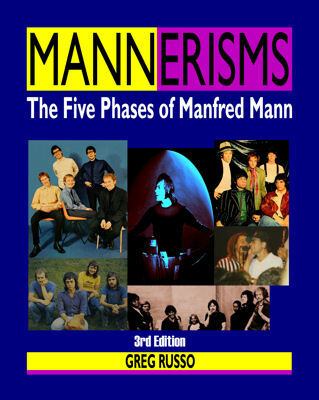 If you thought Manfred Mann only had one phase, it's time to get with it and buy this book!